Habs shot margin, 14-3, at intermission - resembles a Pats score. The Canadiens are 14-2 when leading after the first period. 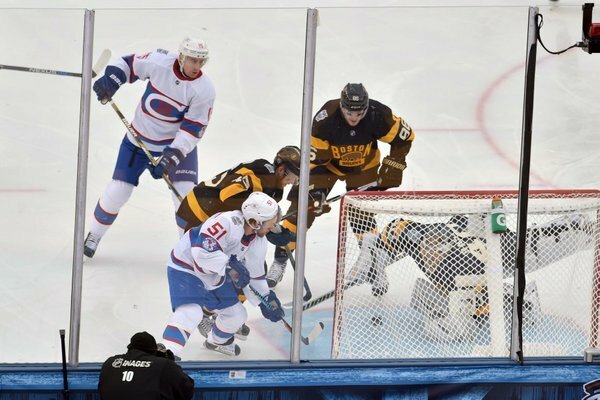 Paul Byron makes it 2-0 for #Habs at #WinterClassic . 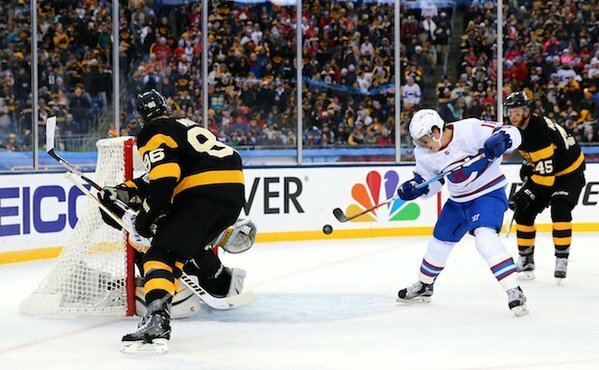 Habs outshooting Bruins 17-5 two minutes into second period. Well, at least the other end of the ice is getting a workout now. Kevan Miller of the Bruins goes off for cross-checking at 2:51. 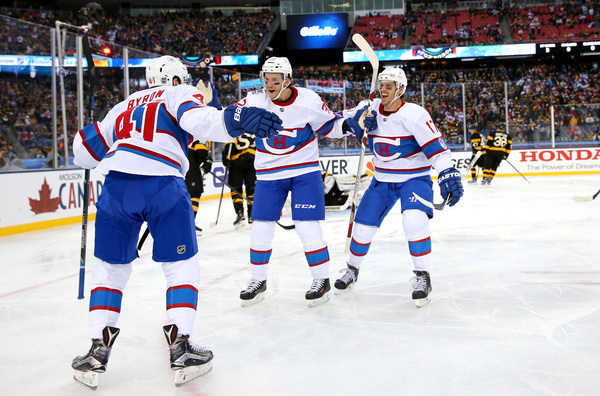 Mark Barberio gets his first point as a #Habs , picking up assist on Paul Byron's goal at #WinterClassic . After all that build-up, it's really too bad that Mike Condon doesn't actually get to play in the Winter Classic. A Boston writer in press box wondering what it might sound like to hear 70,000 fans start booing the #Bruins . Being outshot 20-7 by #Habs . Bruins alums are being hailed. Could not be worse. Death. Taxes. Habs first 3 goals in Foxboro. Welcome back Gally: #Habs Brendan Gallagher scores from — where else — blue paint, batting puck out of air to make it 3-0 #WinterClassic . #Canadiens seize 3-0 lead late in the 2d period. Max Pacioretty bats pass out of the air to Brendan Gallagher, who knocks it in. Habs were perilously close to being called for infield fly rule. This is typical Gillette Stadium fare. The team in red, white and blue is outclassing an opponent who is complicit in their own demise. Four-star save by Mike Condon on Ryan Spooner. Typical Princeton. Canadiens lead 3-0 after two periods. Mike Condon preserves shutout with spectacular save on Ryan Spooner. Bruins will open 3d period with 1:31 remaining on power play. The Canadiens are 13-2-2 when leading after two periods. Canadiens kill off Bruins power play to open 3d period. Montreal leads 3-0.